Since its establishment, international cooperation in organizing conferences and seminars is one of the strengths of the VNU University of Economics and Business (VNU-UEB). 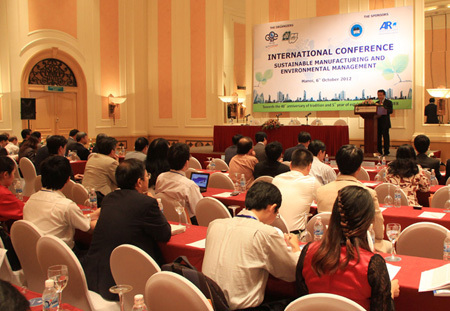 Currently, the university has successfully held major international conferences on important issues, such as sustainable manufacturing and environmental management, macroeconomic risks, management model towards green growth, ASEAN Economic Community - International Experience and Implications for Vietnam, women empowerment and entrepreneurship, etc. During the past several years, the cooperation between the VNU-UEB and strategic partners has flourished. The VNU-UEb has been inviting experts in economics, policy advisory, including world’s leading experts to come and lecture at science conference and seminars at the university. Admittedly, the attracting the world’s prestigious scientists to come for academic exchanges, strategy consulting through public conferences are regularly respected at the university. The university pays special attention to forming an international academic environment for scholars, consultants, researchers and students to exchange and discuss together.